The two major causes of tooth loss are: decay and periodontal (gum) disease. Through good dental hygiene we can prevent these conditions or deal with them in a quick and easy manner. It is widely recognised that your oral health has an impact on your general health & wellbeing. Nowadays many people turn to cosmetic dentistry, or ‘aesthetic dentistry’, as a way of improving their appearance. Treatments can be used to straighten, lighten, reshape and repair teeth. Cosmetic treatments include tooth whitening, veneers, crowns, bridges, tooth-coloured fillings and implants. For those who do require urgent dental treatment, we always keep emergency times set aside in our day to accommodate anoyne with a dental emergency. At Cuddigans, we will always do our best to deal with your emergency, no matter what treatment you require. Our practice is a modern, well equipped and comfortable surgery located in a beautiful Grade 2 listed building in Brentwood High Street in Essex. We are a family run surgery and we pride ourselves on our personal touch, getting to know our patients and their families and forming excellent and lasting relationships with them. The very best interests of our patients are always our primary concern. Our dentists are able to perform highly advanced restorative and cosmetic dental care in a pleasant and relaxing environment. We offer Private, Denplan and NHS treatment. Our staff are highly qualified, professional and caring. 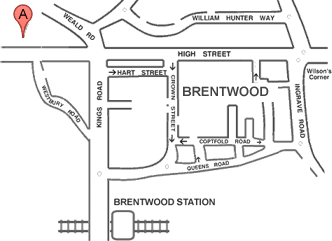 We have been looking after the people of Brentwood and their smiles for over 40 years. We have a loyal patient base with some of our patients travelling long distances to continue to see us, even when they move out of the Brentwood area. Many of our new patients come to us through word of mouth / personal recommendation. If you are in search of a dentist, we would love to welcome you to our practice- just a give us a call to register. We look forward to seeing you.